I pack Olive's lunch every day and Kevin's lunch several times a week. I think of it as a HUG FROM HOME in the middle of their days. I thought I'd share some tips, tricks and lunch packing ideas with you in the hopes of getting you excited about packing lunches. These alphabet pretzels are from Meijer. Aren't they fun!?! 1. Pack all lunches at night. It'll make your morning so much better to just reach in the fridge and grab their lunches! 2. Go to the grocery regularly to make sure that you've got plenty of healthy, tasty options for their lunches. You've definitely got to think things out and plan in order to have good lunch foods. 3. Instead of dreading this task, focus on packing a lunch that will bring a smile and be a blessing in your family member's day. I found these food packs in the back to school aisles at Target this month. They have three different packs and I got them all. We reuse them and they're all so cute. I try to pack Olive's lunch box with lots of options for her to eat in 20 minutes. She does not usually eat everything at lunch. Her routine seems to be eat 3/4 of it at school and finish the last 1/4 of it at home for a snack. The freezer pack keeps things cool all day if the lunch bag is insulated. treats: m&ms, hershey kisses, Reese cups, cookie, jelly beans, etc. What do your kids like to eat in their lunches?? 1. We just started using these reusable snack bags from Bumkins a few weeks ago and love them. I got two sets so each kid has two different bag options for lunches or snacks on the go. They unzip easily for the kids and this size holds a good size snack. We always do non-melty, non-sticky snacks for these bags (Cheerios, pretzels, Gardettos, goldfish, crackers, etc. We've been using and LOVING our yumboxes for a year now. We have several different ones and use them all. Kevin has taken his lunch in them, too. I pack Olive's kindergarten lunch in them every day and I will pack Fletcher's 2 year old lunch in them when we are on the go. Everyone loves them. I really love how quickly I can pack lunches with Yumboxes. I don't have to wrap up and package each item because each compartment is sealed. It's such a time, money and planet saver to not be using tons of ziploc bags in their lunches each day. I hand wash them to be safe, but they say they are okay to wash in the top rack of your dishwasher. They are leak proof, hold a lot of food and we couldn't love them more. If your kids prefer to eat whole sandwiches, I would recommend this size (Yumbox Panino) or the larger Yumbox Tapas size that easily accommodate sandwiches. If your kids prefer lots of different things, the version with 6 smaller compartments is best. There are 5 half cup sections in the tray and 1 section for dip or a treat. We prefer this version (Yumbox Original). It holds a lot of food and is our #1 favorite style. 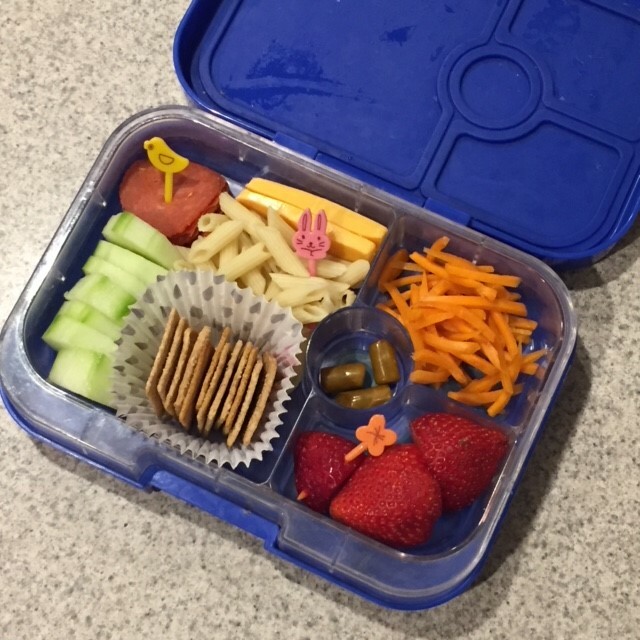 If your child just has to take a small snack or only eats a little lunch, the Yumbox Mini Snack is perfect! 3. Slim freezer packs work great with yumboxes. I just add one to a lunchbox with a thermos and a yumbox to keep things cold until lunch. They hold 12 oz of liquid and claim to keep things cold for 12 hours. I fill Olive's with ice water at 7:30am and it still has ice in it when she gets home in the afternoon. 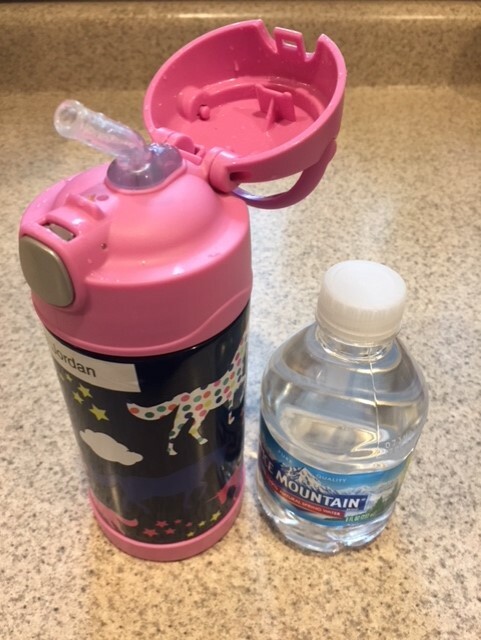 I love the easy button opening, the straw and they are really durable. Both of my kids have them and love them. There are about 30 different colors/characters/patterns to choose from. Since several of these lunch box supplies are a bit of an investment, I made sure to label every single one with Olive's full name. That way they'd be easier to spot in lost and found if they ever found their way there. I got this label maker for Christmas and LOVE it. PS Some affiliate links included. Thanks for reading & supporting Polka-Dotty Place! Whitney!! You are SO fun! I want you to make my lunch every day!! So many cute ideas!! I need to start packing my lunch at night. I'd save so much time in the mornings! :) Thanks for sharing. I am excited to pack Connor's lunch as well. I am going to allow him to pick 1 day a week that he wants to eat lunch at school. My goal in doing so is that he will hopefully try new to him foods. But I love your "hug from home" because that's exactly how it should be! I think the bento boxes are so fun! I need to get some! Those are some great ideas! We love those zip snack bags and I’m really intrigued by the Yum boxes. We have been using Easy Lunchboxes this summer and they’re really nice but you have to section off the different areas for small portions, which takes time. So I like the idea of lots of spaces! Making lunches the night before is definitely the way to go...I used to be in the habit of doing it while I made dinner, but kind of got out of it. And now it is hard to go back, haha! But it sure makes the morning a lot easier. I will put the insert of our bentgo boxes in the top rack of dishwasher but I always handwash the casing to be safe too! Be sure to get a set of silicon baking cups, they're great for adding color/interest to the lunchbox, as well as keeping foods separated (AND keeping the holes easier to wash. I especially use them for things like ranch, peanut butter, etc. that will leave a residue if I don't want very carefully). I don't have a label maker so we have a set of labels from etsy with names for clothing and then another set for lunch items. And inch bug labels, of course! I have a few sets of fun food picks, if you look on amazon, there are mickey ones and such! I've never seen those napkins but am definitely searching for them now! Thanks for sharing! I love seeing what other moms pack!